Shelley Gray explores the themes of class and equality. There are those who wish to keep the upper class to themselves. There are those in the lower class who believe the boundaries’ cannot be crossed. However there are characters who look beyond the outward appearance and see the person within. Eloisa is one such character. With her, conventional boundaries are blurred, and consequently she has a lovely relationship with her maid. The injustices of the time are highlighted in the novel, as the reader is introduced to Hope House. This is a refuge for women and children. Even officer Sean is not allowed inside its doors. There is a beautiful and touching scene described with six year old orphan Greta. Within the novel romances begin to bubble. Attractions are fought. Will love win through? The family theme is shown in Deception On Sable Hill. There are many different types of families. Eloisa’s are rich, they love her but their goal is to see her marry well. Sean’s is a large, welcoming, hospitable Irish family. There is also the Hope House family, bonded together by circumstance. As well as the wider family of God. The theme of forgiveness crops up in the novel. Forgiveness needs to be dispensed because without it, one will live a life trapped in bitterness and with one foot firmly planted in the past. 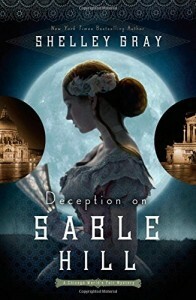 I love all Shelley Gray’s novels and Deception On Sable Hill is no exception. There is something for everyone within its pages – history, romance, social comment and thrilling action. I kept trying to guess who the Society Slasher was, and I must admit, I got it wrong (again!) Deception On Sable Hill is a fabulous novel. It is part of a great series, and I cannot wait to read the third and final book Whispers In The Reading Room.